Five Egyptian political parties and movements unite to form the Coalition of Socialist Forces, they announced in a meeting on Tuesday, 10 May. The newly formed coalition is made up of the Social Party of Egypt, the Democratic Labour Party, the Popular Socialist Coalition Party, Egypt Communist Party and Revolutionary Socialism. 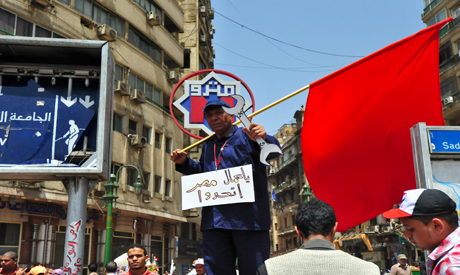 It aims to include under its umbrella other socialist movements in Egypt, which are considered fragmented. “We [social political activists] are optimistic that the Coalition of Socialist Forces will bring a stronger socialist presence onto Egypt’s political scene” said Gigi Ibrahim a political activist. During Tuesday’s meeting, there were intense discussions regarding the recent turn of events in the country and how it impacts the revolution. The Coalition of Socialist Forces has appealed to all Egyptians, irrespective of their ideologies, to amass in Tahrir Square on Friday 13 May in a bid to protect the demands of revolution and for national unity. we are from india and we belong to a marxist-leninist party. as a communist party we are keenly watching the development in egypt. we extend fraternal support to the coalition.we wish to study about the ruling class of egypt and the posititon of the revolutionary masses.what would you like to recomend to get acquinted the said factors .please.